The fifth edition of this classic textbook has been extensively revised, but remains faithful to the principles that established it as a favourite among teachers and students around the world. The book is divided into six parts: theoretical concepts and hydrogen, the s-block, the p-block, the d-block, the f-block, and other topics (the nucleus and spectra). 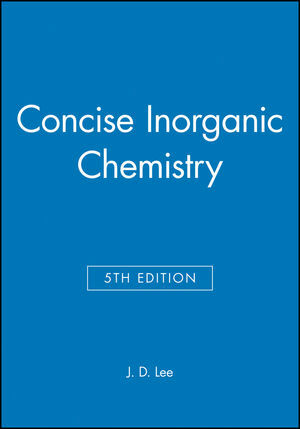 An important aspect of the book is its focus on the commercial exploitation of inorganic chemicals, something other textbooks do not cover, and this coverage has been expanded for the fifth edition. The treatment of the inorganic aspects of environmental chemistry has also been extended. John Lee is a Senior Lecturer in the Department of Chemistry at Loughborough University, UK and is the author of many books and journal articles. Nomenclature in the periodic table..
Part One: Theoretical Concepts and Hydrogen. Chapter 1. Atomic structure and the Periodic table. Chapter 2. Introduction to bonding. Chapter 3. the ionic bond. Chapter 4. The covalent bond. Chapter 5. The metallic bond. Chapter 6. General properties of the elements. Chapter 8. Hydrogen and the hydrides..
Part Two: The s-Block Elements. Chapter 9. Group 1 - The alkali metals. Chapter 10. The chlor-alkali industry. Chapter 11. Group 2 - The alkaline earth elements..
Part Three: The p-Block Elements. Chapter 12. The group 13 elements. Chapter 13. The group 14 elements. Chapter 14. The group 15 elements. Chapter 15. Group 16 - the chalcogens. Chapter 16. Group 17 - the halogens. Chapter 17. Group 18 - the noble gases..
Part Four: The d-Block Elements. Chapter 18. An introduction to the transition elements. Chapter 19. Group 3 - The scandium group. Chapter 20. Group 4 - The titanium group. Chapter 21. Group 5 - The vanadium group. Chapter 22. Group 6 - The chromium group. Chapter 23. Group 7 - The manganese group. Chapter 24. Group 8 - The iron group. Chapter 25. Group 9 - The cobalt group. Chapter 26. Group 10 - The nickel Group. Chapter 27. Group 11 - The copper group: Coinage metals. Chapter 28. Group 12 - The zinc group..
Part Five: The f-Block elements. Chapter 29. The lanthanide series. Chapter 31. The atomic nucleus. Appendix A. Abundance of the element sin the earth's crust. Appendix B. Melting points of the elements. Appendix C. Boling points o the elements. Appendix D. Densities of the solid and liquid elements. Appendix E. Electronic structures of the elements. Appendix F. Some average single bond energies and some double and triple bond energies. Appendix G. Solubilities of main group compounds in water. Appendix H. Atomic weights based on 12C = 12.000. Appendix I. Values of some fundamental physical constants. Appendix J. Electrical resistivity of the elements at the stated temperature. Appendix K. Top fifty chemicals in the USA, 1994. Appendix L. Inorganic chemicals manufactured in large tonnages worldwide. Appendix M. Minerals used in large amounts. Appendix N. Hardness of minerals - Mohs' scale.